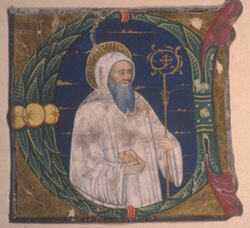 St Bernard of Clairvaux was one of the greatest and most dynamic figures of the Middle Ages. He played a pivotal role in the development of the Cistercian Order, and was an active participant in political and ecclesiastical affairs. Bernard was born in Fontaine, Burgundy, of noble parentage. In c. 1112 he joined the community at Cîteaux. His arrival was a decisive point in the history of the Cistercians and he is often described as the second founder of the Order. Bernards charisma and reforming zeal reinvigorated the community and accelerated its remarkable expansion. Only three years after his arrival at Cîteaux Abbot Stephen Harding sent Bernard to found the third of Cîteauxs elder daughters at Clairvaux (Valley of Light), in the diocese of Langres. Bernards magnetism and fame inspired a number of recruits, among them the future pope, Eugenius III. Bernard was said to have such an appeal that mothers hid their sons from him and wives concealed their husbands. Walter Map, a rather bitter commentator on Bernard and the Cistercians, cynically remarked that the abbot of Clairvaux had carts driven through towns and castles to carry off his converts to the cloister. (1) Under Bernards energetic leadership Clairvaux rose to prominence and soon dominated the Cistercian family tree: during his abbacy sixty-five daughter-houses were founded or absorbed, and eventually there were over 350 houses affiliated to Clairvaux. Bernard was instrumental in bringing the Cistercians to Yorkshire, and the Clairvaux line was by far the strongest in the British Isles. He is sometimes depicted carrying a model of a church, symbolic of his contribution to expansion. From this last (Clairvaux) rose Bernard, and began to shine among, or rather above the rest, like Lucifer among the stars of night. Bernard was canonised on 18 January 1174, but his cult began, unofficially, during his lifetime.